Samsung have paved the way for smartwatches to become a popular thing instead of a, uh, not so popular thing. They were the biggest company that jumped on the smartwatch train way back when most manufacturers were raising their money via Kickstarter. Since then, they’ve released a suite of smartwatches, each one cooler then the last. The only thing Samsung smartwatches lack, however? Circular shapes! Not a single Samsung smartwatch has been round, instead opting for a smartphone-esque square shape. When will Samsung get hip to circles? Perhaps very soon, if these patents are telling the truth, the whole truth and nothing but the truth. A trio of recently unearthed patents suggest that Samsung are preparing a trio of soon-to-be unearthed round smartwatches. 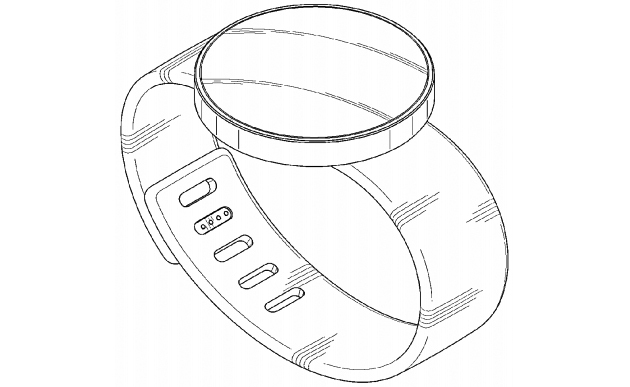 Round smartwatches are anything but uncommon, with Motorola prepping a few of their own. What other features will these rumored watches contain? The pins contain charging clasps, which means it would be charged via the band and not the watchface itself, which is a novel concept. As far as the new way to charge, it also would be able to do all of the usual things smartwatches do, like read texts and, one would assume, tell the time. As far as if these will really see the light of day, your guess is as good as mine. Big companies sometimes make patents just for the heck of it, just in case they one day decide to do something and want to keep your legal ducks in a row. The patents were filed last March and we haven’t seen anything official yet, but we’ll let you know when the info flows down the smartpike.